Carnegie Library of Pittsburgh, better known for housing a wide selection of books, is also a resource for entrepreneurs. The Library is brimming with information on how to start a business, find funding, client lists and more! The 2019 Business Choice Awards will be held on May 14 from noon- 2 pm on the main stage at the Pittsburgh Business Show. Voting is already underway for this unique program designed to recognize businesses that go above and beyond in the Pittsburgh region. Dr. Shellie Hipsky will be presenting at the first-ever Women Who Embrace Life Conference to be held at the Pittsburgh Business Show, the largest business for business tradeshow and networking event in Pittsburgh on May 14 and 15, 2019. The Women Who Embrace Life™ Conference serves as a place where women can connect with thousands of other women who are making an impact as a leader in their businesses. PITTSBURGH – The Pittsburgh Business Show is excited to announce that Dress for Success will be debuting their new mobile boutique at the Show May 14 & 15 at the David. L Lawrence Convention Center. PITTSBURGH – The Pittsburgh Business Show is excited to announce the presentation of the Diversity and Inclusion Certificate program at the Pittsburgh Business Show. The Women Who Embrace Life™ Leadership, Conference, and Networking event will debut at the 2019 Pittsburgh Business Show! This one-of-a-kind event will be held throughout the two-day Show at the David L. Lawrence Convention Center on May 14 and 15, 2019 featuring 100’s of Women-Owned Businesses, networking opportunities, workshops, and more! 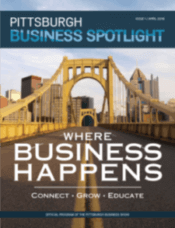 The Pittsburgh Business Show is a can’t miss event with a variety of unique opportunities to network, celebrate, and make connections with the movers and shakers of the Pittsburgh business community. PITTSBURGH – The Pittsburgh Business Show, a woman-owned business, is excited to announce the debut of the Women Who Embrace Life™ Leadership, Conference, and Networking Event at the David L. Lawrence Convention Center on May 14 and 15, 2019. The 2nd Annual Pittsburgh Business Pitch is still looking for participants for the 2019 program. This startup business program provides a life-changing opportunity to start-up business owners in the Pittsburgh area. Get your tickets for the 2019 Pittsburgh Business Show today! With your ticket, you will gain access to the largest tradeshow and networking event in the region. The Pittsburgh Business Show is pleased to announce the return of Marlin Woods as the Master of Ceremonies for the third year in a row. Do you Have What It Takes to win the 2019 Pittsburgh Business Pitch? The Pittsburgh Business Show is excited to announce the 2019 Pittsburgh Business Pitch! This second annual program at the largest business-for-business trade show in the region will offer a once-in-a-lifetime opportunity to business owners throughout the Pittsburgh region. The Pittsburgh Business community welcomes the second annual Business Choice Awards. This program recognizes the extraordinary impact that local businesses have made in the past year in the Pittsburgh region. The Pittsburgh Business Show, recently named on the Pittsburgh Business Times Book of Lists as the 18th largest public event in Pittsburgh, has one hundred thousand square feet of exhibitor space that is filling up fast! With nominations closing on March 1, 2019, now is the time to nominate your favorite business for the Business Choice Awards! This program serves to recognize outstanding Pittsburgh businesses who have made an impact in the past year throughout the Pittsburgh region. If you are looking for a new way to market your business to potential customers and companies in the Pittsburgh and surrounding local markets in the region, then consider becoming a sponsor for the Pittsburgh Business Show today! PITTSBURGH – The Pittsburgh Business Show has been named the 18th Largest Public Event in Pittsburgh by the 2019 Pittsburgh Business Times Book of Lists. Check out our 2018 Show Program! the show you can’t miss! Download our mobile app on the app store and the google play store! A SHOW SUPPORTED BY PITTSBURGH COMPANIES FOR PITTSBURGH COMPANIES. For Promotions, Show News, and More! Copyright © 2018 Pittsburgh Business Show, LLC. All Rights Reserved. Web Design by Higher Images, Inc.